There will be a write-up over the next few days on how you can customize this template to suit your branding and how to integrate the flash banner using gadgets. So stay tuned. This template is using, for lack of a better term, a "fake" flash header. 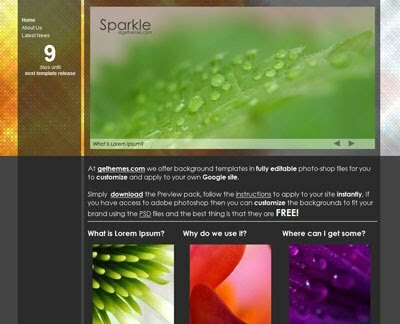 This "fake" header is created using a flash embed gadget wrapping a custom flash swf file. The logo/header has been disabled and the flash gadget is sitting in the uppermost panel in the three column layout. I found the XML for the gadget here and made some slight edits to make it fit the site a bit better. I then made a simple flash swf which I uploaded as an attachment for the gadget to draw from. If you'd like to do this for your site and need help drop us a line at the getheme discussion group and we'll try to help out. If there's enough interest I'll write up a walkthrough. One bug that the template suffers from is the fact that the site content drops while the background image stays static. This only happens when you're in edit mode, or when you've submitted the site as a template. This causes a banner to appear at the top and the content will drop down relative to the banner size. Otherwise it'll look normal. Let us know if you love/like/hate/despise it.